Hiccup success to untie his race and Dragons in his village since five years ago. Hiccup's father planned to make Hiccup to become leader of his clan village. But, he not interested in the leadership skills to take care his village. 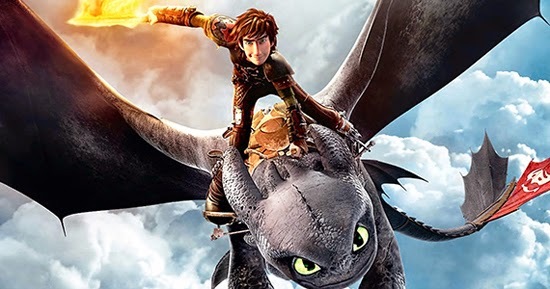 That is why Hiccup and Toothless’s journey keep to explore new territories, discover new dragons, and experience an exciting adventure around the world! Until he discovered new types of Dragons still be there! He met his own mom who be alive! His mom always think of Hiccup while she promised to protect Dragons from the humans who want to kill Dragons... Hiccup and his mom are alike alot! They also have same skills to tame Dragon, so wow! I think that his mom are strong and never give up about keeping to save Dragon which she found at outside. I glad that it is very good for family's story to make us to understand so easier. I learned that his parent have to separate each other for long years but, they still recall about their love! Wow, Drago Bludvist who is bad person that can make Dragon scare to him! He took revenge to make Dragons become his slave with used his ultimate weapon, a giant king Dragon! So, Hiccup is convinced there’s a peaceful way to stop it from happening in the war! But, Hiccup failed. 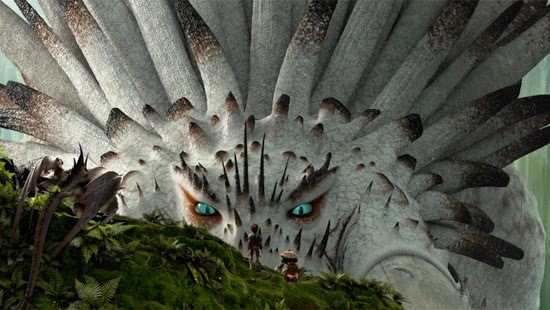 After Hiccup's dad passed away, he stand up within the support from his good friends and family! He tried to change the Dragons than a giant king dragon control all Dragons! 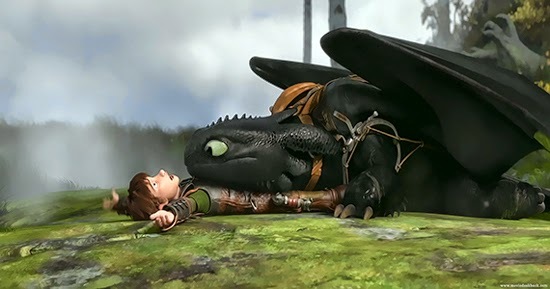 Toothless don't want Hiccup troubled in the war so it tried to be strong and never scare a King Dragon again! 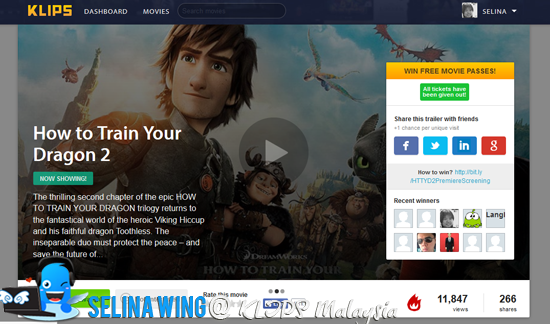 The lessons are you can learn more about the tips & trick skill to train a dragon, no need to kill in the blood! 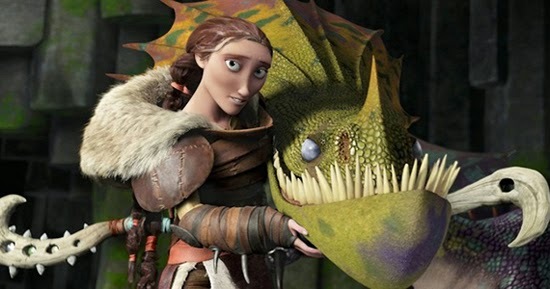 Hiccup and Toothless become mature while they are very understand each other and like to show their bravery action after they experienced their painful memories! I felt this movie are focusing on the touching parent-child relationships, and bring the positive messages about the bond between people and their pet animal companions so they become best friend forever, this is must-see for the kids and adults who love to watch it! Thank you to KLIPS Malaysia for this movie! 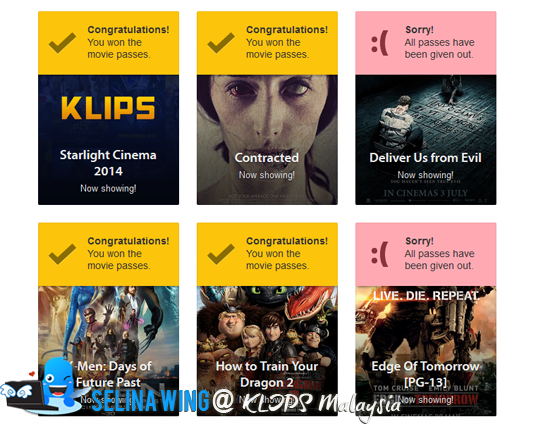 How I get to win a FREE pair of ticket when I choose the movie with "FREE Passes" at KLIPS Malaysia website? You only do 3 steps so very EASY! Two - You only did share/write creative status on the links on her Facebook and Twitter. Remember you set it as Public before you put a share on Facebook. Three - Says.com @ Klips send the email/ SMS to you when you have high chance to win FREE tickets! You can choose 2 options; 1 - collect your tickets at KLIPS office or 2 - ask them to post your home! Easy. I was winning on 9 times already. Great? How? Just promote the movie links via my social media only. I did nothing! Easy! come to JOIN US la!